Thanks to all our weather-resistant customers for coming to shop last week in spite of the forecast; we did manage to make it through most of the morning before the deluge started! Our drenched vendors appreciated your efforts to make their day less of a wash-out. The Honey Shop returns this week with cool and delicious offerings designed to take the heat out of the kitchen (but leave some in your mouth!) 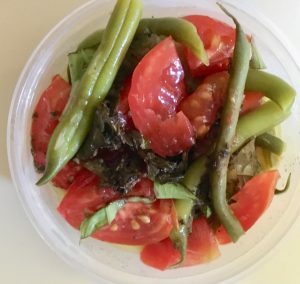 Kathy promises to bring this organic green bean salad; lemon hummus and salsa-strawberry kombucha will be featured as well. And don’t forget that our market has several vendors who do the cooking for you: Ja Patty (baked Jamaican-style filled pastries), Matilda (Dominican-inspired empanadas and plantain chips), Pak Express (Southeast Asian nime chow), Little Falls Cafe (gourmet pizza strips). And there are many no-cook options, too: nut butters and cheeses from the market table, smoked fish from the Local Catch, and peaches and berries from Barden Orchard. Celebrate National Farmers Market Week! Come to the market, take a fabulous photo, and enter Farm Fresh RI’s Instagram contest. The winner will receive $50 to spend at the RI market of their choice. You’ll find dozens of picture-perfect subjects for your entry, from deep-purple eggplant to ice-cradled cod, tons of tomatoes to plump peaches, beautiful breads to smooth squash. Our vendors are pretty photogenic, too!